#35 Woodworking | Step Right Up and Spin the Wheel! So was born the Wheel of XP. 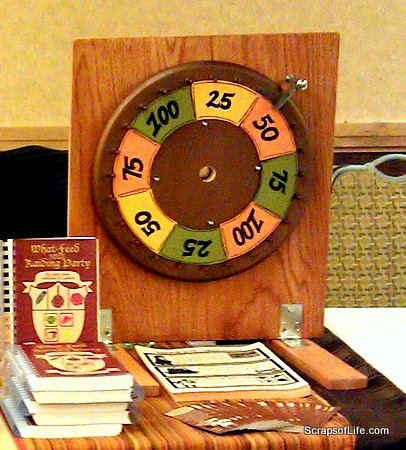 Those prize wheels you see at conventions, casinos, trade shows, and other events are reallyÂ irresistible–you hand just itches to spin the wheel! So first I looked at buying one, figuring I had just enough time to have it shipped before the launch party. Do you know they want $250 (or more!) for a flimsy plastic version?! Definitely not in my book launch budget, but it can’t be that difficult to DIY one, right? And ours would be better! About 2 weeks before the launch I proposed my plan to Todd, who I’ve already explained is the handyman in this family, and we proceeded to spend that Friday night’s date night traipsing through Lowe’s, looking for all the pieces we’d need. In the picture above you can see a 1″ hole drilled through the center of the front disk, that’s so we could eventually add another carriage bolt with a round sign (decorated CD) that would stand out enough from the moving parts but not move itself. That part’s still not done yet, but it will be in time for our next show at the end of September. At the one convention we’ve taken it to, so far, though, we had plenty of people come up and ask us what the wheel was for and if they could spin it. Mission accomplished? I think so. The tools required for this were a drill and various bits and a table saw or circular saw for the straight cuts. Of course, if all you’ve got is a drill (or it’s all you’re willing to invest in at the moment), most hardware stores will do straight cuts for you at a nominal cost (.25 a cut) or sometimes even free. Now, we use our wheel the give extra presents to our customers, you may not have such a need, so why is knowing how to build your own prize wheel a useful bit of trivia? Oh, I don’t know, how about for use at a school carnival or carnival-themed birthday party, a prize wheel for your next work fundraiser, or incentives for your kids accomplishing goals. Along that line, you could make one into a chore wheel or a rainy-day fun wheel. Points you earn for completing a single or series of tasks. In the case of the cookbook, you earn points for cooking the dish successfully (basically, no one feels the need for take-out). The more points you earn, the higher the level you achieve.